Thiruvananthapuram: Kerala Tourism has launched an initiative blending tourism and knowledge of Ayurveda to woo more holidayers. Titled Ayurbodha, the programme gives tourists not only an opportunity to savour the unmatched grandeur and beauty of the state but also enlightens them with the basics of life-changing Ayurveda and its virtues as a holistic wellness system, department sources here said. 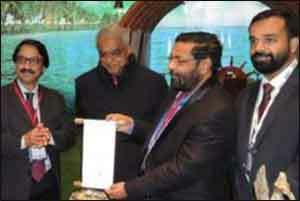 Kerala Tourism Minister Kadakampally Surendran formally launched the newest product of the Kerala Tourism Development Corporation (KTDC) at the ongoing World Travel Mart in London, which began yesterday, according to a release. Under the initiative, the traveller could stay at any of the KTDC resorts located in the captivating and pristine parts of Kerala and learn about the ancient medicinal stream of Ayurveda. The focus would be on basic home remedies and diet regimes, Ayurvedic practices for the rejuvenation of body and soul, secrets of pressure points, basics of panchakarma treatment and the history and use of medicinal plants, it said. The highlight of the programme was that the traveller goes back not only enlightened but also with a certificate for gaining knowledge of Ayurveda, the release said. Ayurveda, as a wellness system and a mainstay tourism product, has been largely confined to treatments and massages. While Kerala was known as a destination for spending serene and peaceful holidays, the time-tested tradition of the ancient Ayurveda could enrich every visitors experience, Surendran said. The launch was attended by Venu V, Principal Secretary, Kerala Tourism, Bala Kiran, Director, Tourism, R Rahul, Managing Director, KTDC and industry buyers from various countries, among others. Ayurbodha would cover the best of locations of KTDC in Kerala. KTDC has roped in the best of the Ayurveda practitioners for the Ayurbodha initiative. Through this programme, the visitors would get a primary knowledge on the depth of Ayurveda and its wider use, which will surely be a unique experience to them, said KTDC Chairman M Vijayakumar. The 15-day Ayurbodha package has been priced at just 100 dollars a day per person, and it includes accommodation and complimentary breakfast. The location could be chosen according to one’s preference. The November 6-9 World Travel Mart is being attended by around 51,000 travel professionals and key industry buyers from around the world, the release said.